Join the discussion on our forums! Come discuss Dark Conviction over in our dedicated Dark Conviction discussion topic. keeper of uldaman is so much better for 2 extra mana you get a 3/4. I'll take a hero power that gives me a 3/4 anyday. A reprinted version of Keeper of Uldaman without a body. NONE MAY STEAL OUR SECRETS! Cheap and versatile, gonna see this is a good amount of decks. Such as Zoo, Control and Quest. 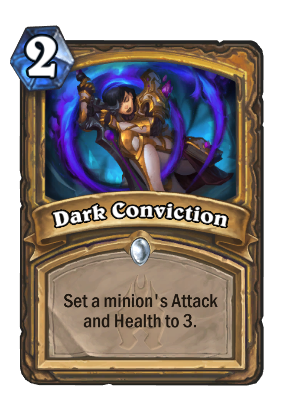 But I think this card seems more valuable as an Arena card than in constructed. if you play it defensivley, you don't need it. It's better to play something else in that case.